Frow, John and Clemens, Justin (2013). On Personhood in Public Places. Surpllus Pty Ltd in co-operation with the Research Unit in Public Cultures, The University of Melbourne, RUPC #1/Surpllus #13.1. 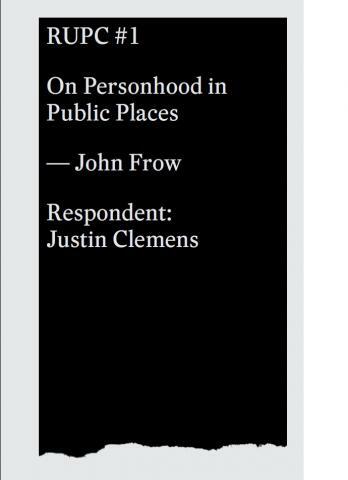 In this first publication for the Research Unit in Public Cultures, John Frow sets about asking, how do people figure and perform themselves in the public sphere? One answer to this question has to do with the offices by which people are defined in traditional status systems, and the gradual dissolution of those office-based ties of status, of kinship networks, of community, of religion, and of patronage in the passage to modernity and to contract-based individualism. Professor Frow will propose a different kind of answer, however, which thinks about the legal and religious underpinnings of personhood across the discontinuities of tradition and modernity, and which explores the status of the person in new modes of public circulation of selfhood, new modes of public intimacy, and a new malleability of the self and its boundaries in a world characterised by a plurality of public spheres and of the ways of being a person that they make possible. Frow, John and Clemens, Justin (2012). On Personhood in Public Places. Research Unit in Public Cultures, No. 1, The University of Melbourne.